Instead, as I described in more detail in my last article, the St James tunnels were intended to provide an interchange between the City Circle and Bradfield’s planned line which would have run to both the eastern and the western suburbs. Unlike the extra platforms at Town Hall, the additional infrastructure would not only have allowed passengers to interchange, but also would have permitted trains to transfer from the eastern suburbs line to the City Circle, and vice versa. Bradfield’s 1925 City Railway plan (detail). The map of Bradfield’s 1925 plans, reproduced in Richard Raxworthy’s biography of John Bradfield, The Unreasonable Man, shows the route (see detail map for a clearer view). 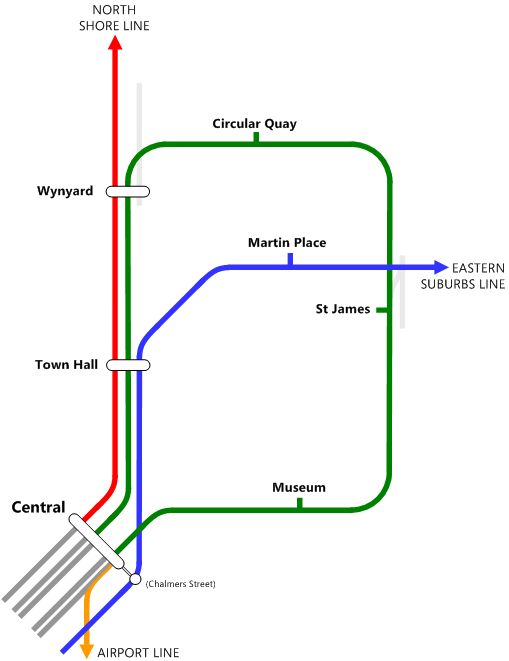 Coming from the east, the eastern suburbs line would have run through St James Station from the south (north is to the right of the map) to provide a cross-platform interchange with the City Circle. The line would then have headed north for a short distance but then curved sharply back south almost in a U-turn before running to two stations a short distance apart in the heart of the city. The second of these planned stations would have provided an interchange (but not a direct link) with Bradfield’s proposed northern beaches line which would have extended from the Bridge via an interchange with the City Railway at Wynyard and to additional stations just south of Hyde park and east of Central. Meanwhile, after crossing the northern beaches line, the eastern suburbs line would have proceeded to Town Hall where in effect it would have become the western suburbs line. This would have run south from Town Hall to another station near Railway Square, before turning west to run to the inner western suburbs. Why were some sections of tunnel built then abandoned? The Government authorised construction of Bradfield’s plans in two bills; one covering the underground City Railway (what we now call the City Circle) in 1916 and the other the Harbour Bridge, including the rail connection through the city in 1922. Both bills also authorised other connections –the first stages of the eastern and western suburbs lines and the additional tracks across the Harbour Bridge to provide the future northern beaches extension. The latter section, across the eastern side of the Bridge between North Sydney, Milsons Point and underground platforms at Wynyard, was built but never used by trains. Trams used the corridor until they were scrapped and the line turned into additional traffic lanes across the Bridge. Bradfield prioritised construction of the City Railway but in doing so he also built two small but critical interchange sections to ensure the eastern and western suburbs lines could be commenced later without too much disturbance to the City Circle. The first was the interchange tunnels and platforms at St James, while the second was extra platforms at Town Hall. Neither line was completed during Bradfield’s lifetime. This was a consequence of the government’s huge bill for infrastructure projects (including the Bridge), the impact of the Depression and the growth of private vehicle use. Eventually the Eastern Suburbs Railway (ESR) opened in 1979, but only as far as Bondi Junction and on a different alignment to Bradfield’s. The line runs via Martin Place Station instead of the St James interchange, though it does use the spare Town Hall platforms which Bradfield built. The western suburbs line was never constructed. How much was actually built? 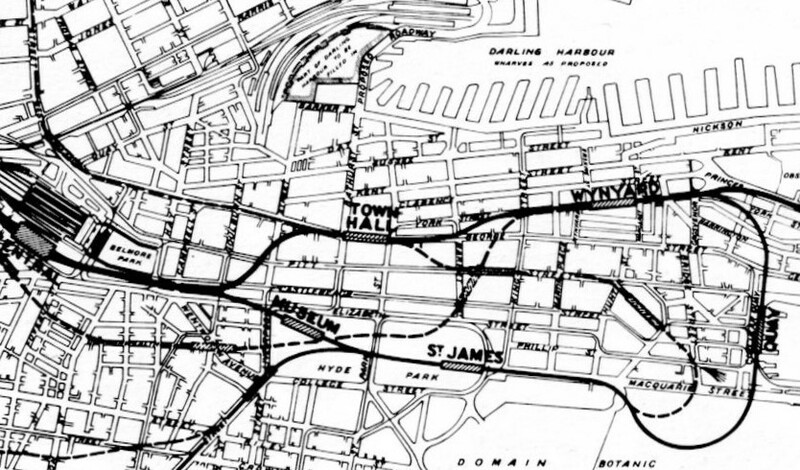 The remaining diagrams show more clearly the relationship between the fragment of Bradfield’s planned eastern suburbs railway that was constructed at St James Station to link to the City Circle. This segment was designed to avoid any at-grade crossings of the tracks for the latter. 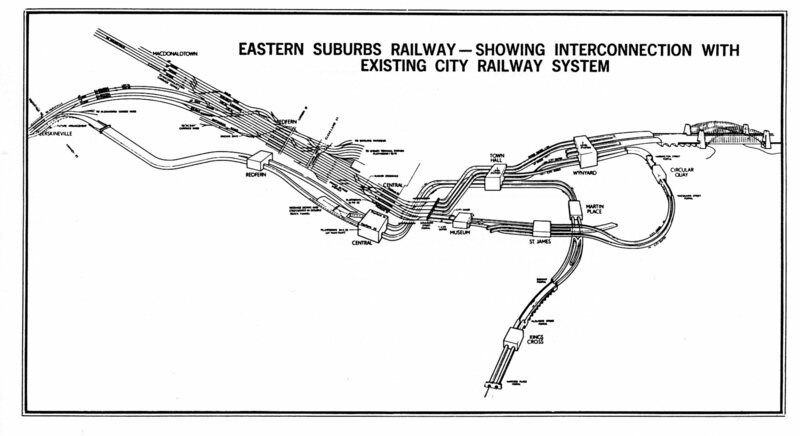 Eastern Suburbs Railway interconnection diagram. Source: R Raxworthy (1989), The Unreasonable Man. From the south the twin tunnels start under Whitlam Square at the intersection of Liverpool and College Streets near the southeast corner of Hyde Park (again, north is to the right of the map). They then cross over the outer City Circle tunnel to run to platforms at St James Station between the existing city Circle ones. 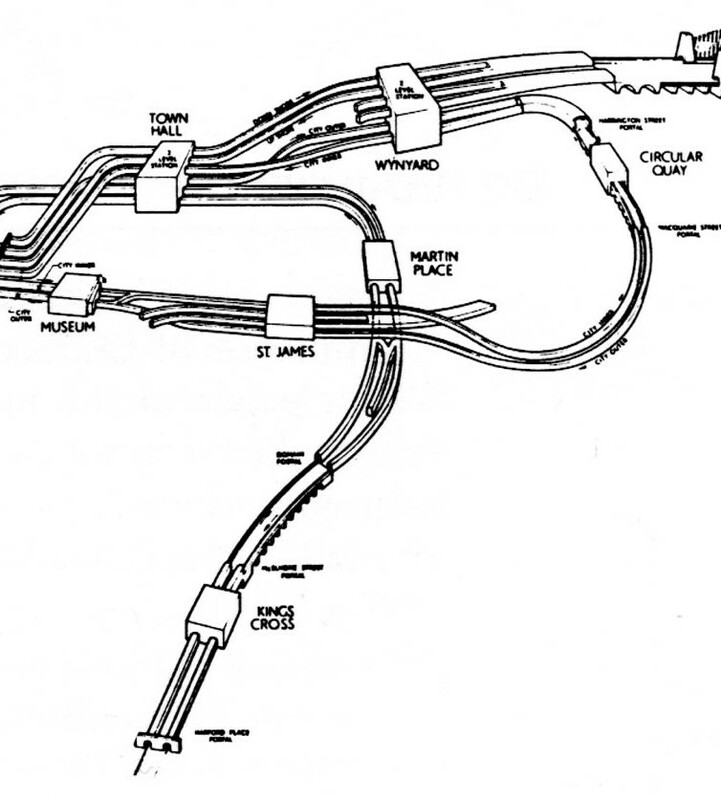 Eastern Suburbs Railway interconnection diagram (detail). The platforms for the eastern suburbs line were never used and were eventually covered over, which is why there is such a wide gap between the City Circle platforms there. Just north of the station there are also stub tunnels which were once used to reverse trains, as St James was a terminating station before the City Circle was finally completed in 1956. Heading north from St James, the tunnels cross over the inner City Circle tunnel, veering northwest to start the turn back towards Town Hall Station while the City Circle turns northeast before curving back west to head to Circular Quay Station. This segment of the eastern suburbs tunnels runs under Macquarie Street from the station to a point parallel with the State Library building. What is the government proposing to do with the tunnels? The government is seeking expressions of interest (EoIs) “from Australia and around the world to activate the hidden space”. While the Minister states that he wants the “best proposal” it is clear there is also a strong commercial imperative. The EoI process will run for only a little over six weeks and there do not appear to be any plans to run any sort of consultation process to gauge community preferences. This is far too short a period, and clearly favours those with the resources to put together an adequate response very quickly. This could result in a single private sector bidder being offered effective control of the project and the site, effectively amounting to the wholesale privatisation of a publicly-owned, albeit unused asset. Ideally the redevelopment would provide for widespread community input to the design, ensure public access and incorporate a range of non-profit community and cultural uses as well as commercial ones. However, there appear to be two positive aspects. One is that only the northern section is being considered, the significance of which I’ll come to in a moment. The second is that the Minister has indicated that the redevelopment of the tunnel could also involve an underground pedestrian connection between St James Station and Martin Place Station, which will also be an interchange station for the Sydney Metro. If the proposal does go ahead, this would be a sensible idea. The tunnel runs only about 50 metres or so away from Martin Place Station. Adding a connection from there to the station would complement the already-foreshadowed pedestrian link from Martin Place metro station to Wynyard Station, ultimately providing an underground pedestrian corridor across the central CBD from Barangaroo in the west to St James and Hyde Park in the east. A Martin Place entrance is also a simple way of guaranteeing there are multiple exit points in the event of fire or natural disaster from what otherwise could be, literally, a very long dead-end. Why can’t the tunnels be used as rail corridors? This is where the Minister has made a rod for his own back. By inferring the purpose of the tunnel was to provide a connection from the eastern suburbs to the northern beaches he inevitably invited the reaction: why doesn’t the government just continue with Bradfield’s plans and build the link? The fact is the northern section of this tunnel (the portion apparently covered by the EoI) was not designed to go the northern beaches at all and its potential to be extended as a rail corridor is very limited. 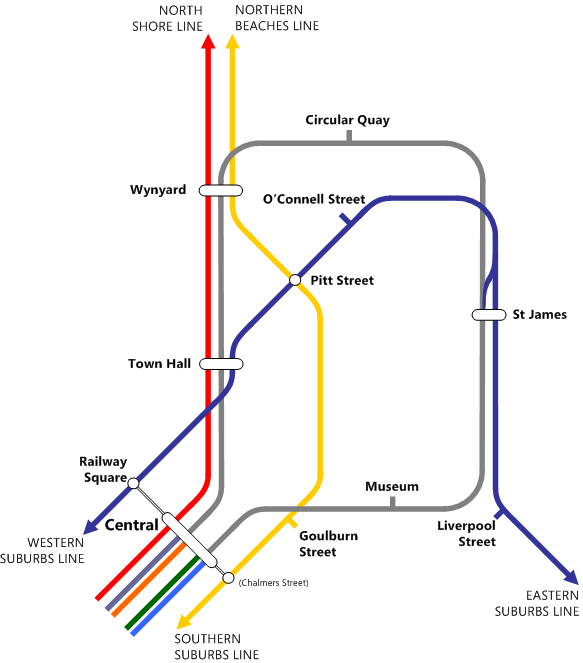 Its original purpose – to connect the eastern suburbs line back to Town Hall Station via the CBD – has been superseded by the revised route the modern-day Eastern Suburbs Railway takes through Town Hall and Martin Place. The tunnel is also very shallow as it was constructed by cut-and-cover methods and therefore would be very difficult to extend further in the modern-day CBD, let alone across the harbour. In any case the second cross-harbour rail tunnel is already under construction west of the bridge and any future northern beaches line is likely to be connected to that. The situation with the southern section is somewhat different and it is interesting that media reports suggest it is not being considered for potential development at this stage. This may be because there are technical issues, or because opening up both sections might put too much pressure on access via St James Station – or possibly because the government wants to stage the project. There another intriguing possibility; this section is not being redeveloped because unlike the northern section it still has some potential for transport use. I recall (but cannot reference) several proposals in the 1980s or 90s to drive a tunnel connecting the unused platforms at Central Station with those at St James. One suggestion was to use this tunnel to provide additional capacity for suburban services into the CBD; another was to use it to make St James Station the Sydney terminus for a very fast train. There is a third alternative use. Some time ago I wrote a post on issues relating to the CBD and Southeast Light Rail (CESLR), currently under construction. One of these was capacity, given the CESLR is likely to be full effectively from the first day of operation, and I listed a number of options including a metro line or the extension of the Eastern Suburbs Railway to an interchange with the light rail. Another option I suggested was to add capacity directly to the CESLR by connecting an additional CBD line from Moore Park to near Oxford Street and then into the spare tunnels and platforms at St James. This would however require the construction of extra tunnels and surface track from Whitlam Square to Moore Park, a route which is complicated by the presence of the Eastern Distributor tunnel. Ironically, conversion of the southern St James tunnels would echo some of Bradfield’s earlier proposals to put trams underground in the city in a similar manner to Boston’s Green Line. In any event there is a strong argument to retain the southern section and to conduct a comprehensive review of the options for its potential use as transport infrastructure. This statement is a little disingenuous. The bulk of Bradfield’s “plans to connect Sydney”, as represented by the City Circle, the Harbour Bridge and electrification of the rail network have worked spectacularly well; if his plans “have not worked in this case” that is because his proposed eastern and western suburbs lines were never actually built. Bradfield’s main shortcoming may have been to plan on too grand a scale, given the limited resources available at the time. It was however the subsequent governments which, blinded by the dramatic post-war rise of car ownership, failed to invest in the rail network for nearly 50 years after the construction of the City Railway and the Harbour Bridge. By the time later governments belatedly recognised the need for new lines, Sydney was a very different size and shape to the 1920s and it was too late to construct Bradfield’s projects as he planned them. This is a shame, but sensitively adapting the northern tunnels at St James Station for alternative uses incorporating a strong community element while retaining the southern section for potential transport purposes could ensure that his legacy is not entirely wasted. Updated to add diagram of current CBD rail lines. This entry was posted in Bradfield, Infrastructure, metro, Public Transport, Sydney metro area, Transport and tagged Bradfield, Infrastructure, light rail, metro, Rail, Strategic Planning, Sydney metro area, Transport. Bookmark the permalink.